This blog was written by Matt Somerville, who is a Senior Teaching Fellow in the Department of Psychology and Human Development at UCL Institute of Education. He is also an Associate Member of the Research for Equitable Access and Learning (REAL) Centre at the University of Cambridge. Matt formed part of the TEACh team, who presented at UKFIET 2017. For the 2017 UKFIET conference, 23 individuals were provided with bursaries to assist them to participate and present at the conference. The researchers were asked to write a short piece about their experience. Sustainable Development Goal 4 focuses on quality education that is both inclusive and equitable. While some progress has been observed in terms of basic literacy skills, bolder efforts are required to meet the learning needs of all children. This is particularly true for children from poor backgrounds, girls, children with disabilities, and those living in rural areas. The Teaching Effectively All Children (TEACh) project, funded by ESRC and DFID, aims to identify strategies to raise learning outcomes for all children, regardless of their background. The research was carried out in India and Pakistan, sampling from 3 districts in each country and 10 villages within each district. Here, I discuss the findings of the qualitative component of the study, using data collected from 6 schools in the Punjab province of Pakistan. The project included both teacher interviews and classroom observations, recognising the central role of teacher perceptions and teaching practice in achieving Sustainable Development Goal 4. 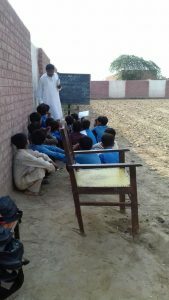 Kasur Boys Primary School. Photo taken by IDEAS Pakistan, 2016. The classroom observation data revealed that many of the children who appeared to be struggling with learning were seated at the back of the classroom. These children also seemed to have fewer interactions with the teacher and were less likely to have their workbooks checked. This was particularly true for the children with disabilities, many of whom appeared to be silently observing what was happening in the classroom but not participating in the learning activities. There were also lessons observed in which considerable efforts were made by the teachers to include and support all learners, including those with disabilities. For instance, a teacher in a Kasur primary school for girls used the blackboard to guide a struggling pupil through a maths problem. She broke the example down into distinct steps and encouraged the child’s classmates to offer guidance, ensuring other struggling children were also able to follow what was happening on the board. It is clear from the data that these teachers face a number of challenges and require further support in order to provide equitable learning opportunities for all children. In particular, additional support focused on how to include children with disabilities appears to be needed. Although there were numerous examples of effective teaching practice observed, not all children appeared to be benefiting from this teaching. Both the teacher interviews and classroom observations provided nuanced reflections on how many of the aforementioned barriers could be overcome. These findings have the potential to influence both policy and practice by identifying ways in which all children can be supported to fulfil their learning potential.